People who have been bitten by the pressure cooking bug cannot have enough of the same. A single cooker soon seems very little and the need for better products becomes prominent. This set is designed to allow you to cook the entire dinner without having to rely on any other utensil. 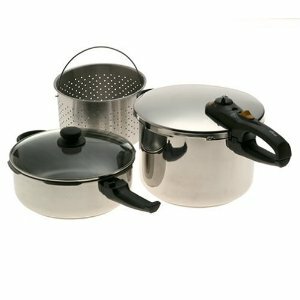 These cookers can double up as cooking pots which make them quite versatile and effective. The set comes with a glass lid and a stainless steel lid. Both the lids fit perfectly on the cooker as well as the pan. So if you have some pulses or beans to be cooker in smaller quantity you can use the pan while meat or rice can be cooked in the cooking pot. Once you are done pressure cooking, you can use the same utensil for your cooking and flavouring. The pan is ideal for such needs and with the glass lid you can actually monitor the progress. So with just a cooker and a pan you can finish your entire dinner quickly. Environment Friendly - Fagor = Green! 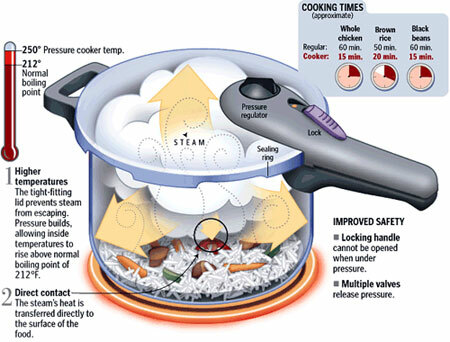 Pressure cooking is general more environment friendly than other forms of cooker. The biggest benefit comes from the fact that with pressure cookers you can bring down your cooking times by nearly 70%. Less cooking time means lesser utilization of energy and heating. This means lesser pollution and obviously lower power or heating bills. While any pressure cooker will give you this benefit, you can take heart from the fact that Fagor actually ensures that every unit it manufactures, is done with minimum harm to the environment and its workers. As a participant of the Energy Star initiative and other such organisations worldwide, Fagor takes environment seriously and so can you by using their products. What else is great in this unit? Spring based dial for pressure control. No need to bother with values to change pressure settings; just turn the dial and you are done. Safety Features: Pressure indicator and automatic pressure release with safety handle lock. Fagor is the least expensive brand that I am aware of which also has the 'modern' features desirable in pressure cookers. Fagor cookers also reach a pressure of 15psi (which is important). Some customer have used it for chicken, roast, vegetables and pork. All the food cooked turned out delicious. It has a clear glass to see what's inside. While most users have been impressed by the marvel of Fagor cookers, the most common complaint about this model seems to be its handle. Most users have found the handle to be of poor quality. And after some usage some cookers have had the handle melt and sometimes even release fumes. This is certainly one factor that you need to weigh while purchasing this product. However, it is not a standard complain, just from some users that purchased this Fagor duo combi set cooker. Amazon.com gives this product a 4.5 out of 5 star rating from 70 reviewers. Most of them said this product is a great time saver, excellent quality cooker and love the multi purpose set.